Add the perfect touch to your homemade Halloween treats and other gifts with these fun Halloween printables! Below you'll find a collection of useful gift tags that pair with some super cute Halloween candy gift ideas plus a few other non-candy gift ideas perfect for friends, classmates, students, teachers and more. Halloween is a great time to kick back and enjoy being creative. It's a relatively low stress holiday with lots of opportunities to enjoy Halloween crafts, fun and tasty homemade Halloween treats... and plenty of silly and spooky homemade Halloween gifts. If you like these things too, you'll probably find the following Halloween printables useful as you create, give and prepare for this fun fall holiday. 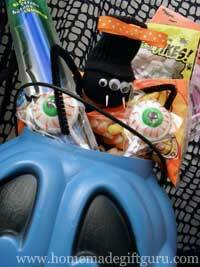 You may also like to use them with one of these fun Halloween gift basket ideas. Print on Card Stock (heavy paper). For best results print on high quality heavy weight paper such as card stock. Backing. These printable tags look extra good with a slightly larger and darker colored backing. Simply hold your tag in front of the backing paper and trim it slightly larger than the tag. Then glue them together for a fun sturdy tag. Crafty. The typing can be left black or emphasized using gel pens or glitter. 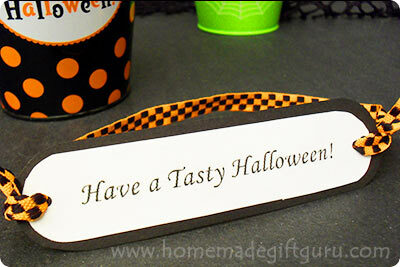 Use ribbon to attach the tags and any other embellishing you'd like in order to make your Halloween tags stand out. Make These Tags in Seconds! 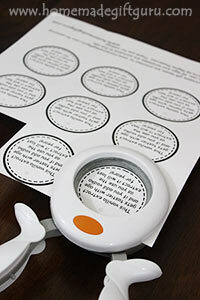 Punch these 2 inch round gift tags out in seconds... By using this 2 inch circle punch, you can pop these simple round Halloween printables out in seconds! I prefer the one linked to because you can see exactly what you're punching out. This is a very handy feature. Of course, you can grab your scissors and cut them out manually as well. Whichever method you choose, the following tags will be a quick and easy way to enhance your Halloween gifts, homemade Halloween treats and Halloween craft projects! These bat-pun Halloween printables have a cute message with a touch of night time spookiness. They are extremely easy to make and they turn simple candy into cute homemade Halloween gifts for friends, family, teachers and co-workers. 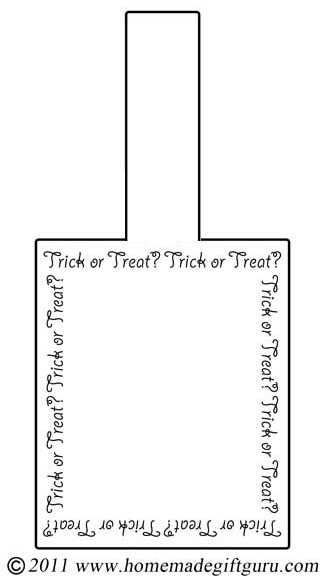 After printing, you can pop these Halloween printables out in seconds using a 2" round paper punch. Bat Toys. 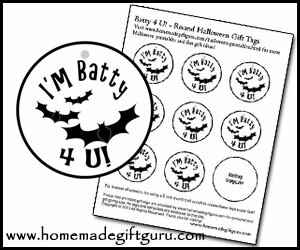 Attach these bat-themed gift tags to plastic bat rings or other bat-themed toys and give them out dressed up as a vampire or as bat man. Candy. 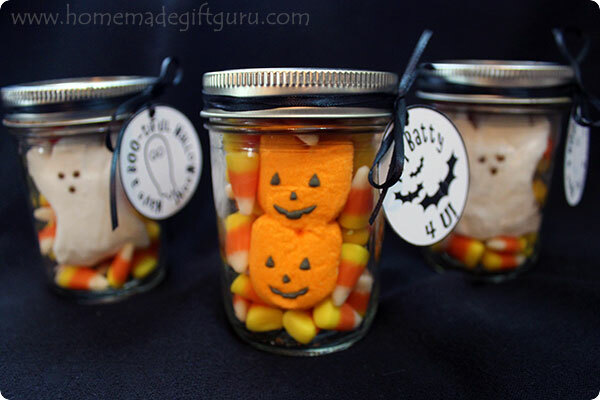 Simply attach tags to small jars of Halloween-themed candy (shown to the right). 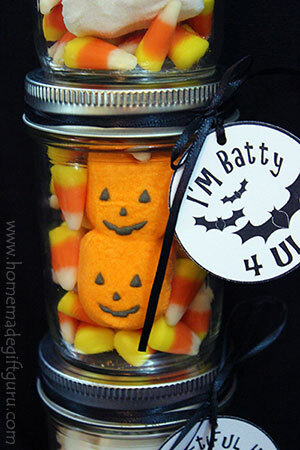 For more info and instructions on making these Pumpkin Peeps in a Jar Gifts, check out these Halloween candy ideas. These little ghost boo-pun Halloween printables have a sweet message with a touch of spooky. 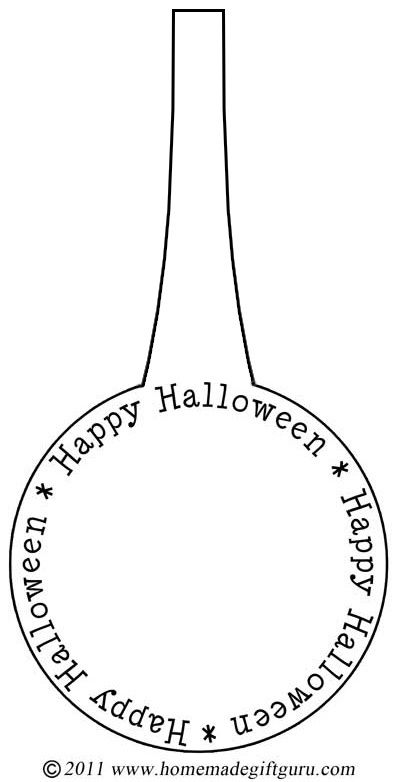 These round Halloween gift tags pop out instantly with a 2" round paper punch. Ghost Lollipops. 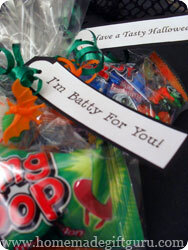 Attach these ghost-themed gift tags to lollipops wrapped in white tissue and decorated to look like little ghosts. Ghost Cupcakes. Attach to ghost themed cupcakes (frosted with a large ghost-like swirl of white frosting with two black ghost eyes and a gaping mouth). Ghost in a Jar. Attach to a jar of Halloween-themed candy (shown to the right). 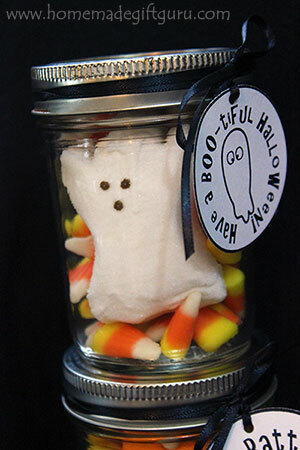 Ghost-themed peeps (get instructions here) fit perfectly inside a half-pint mason jar. 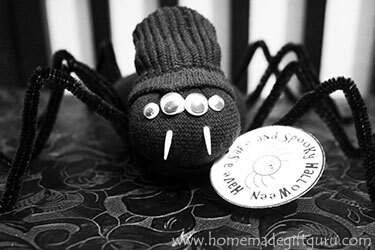 These little safe and spooky spider-themed gift tags are perfect additions to just about any Halloween treat or trinket. Give them out at school, hand them out in your neighborhood, or simply use them to give treats or trinkets to your friends. Homemade Spider Gift. Attach these spider-themed gift tags to a homemade sock spider. Spider Toys. Attach to plastic spider rings and other spider toys. Spider-Themed Treats. Attach to spider-themed cupcakes, spider-themed cookies and other spider-themed treats. Candy Gifts. 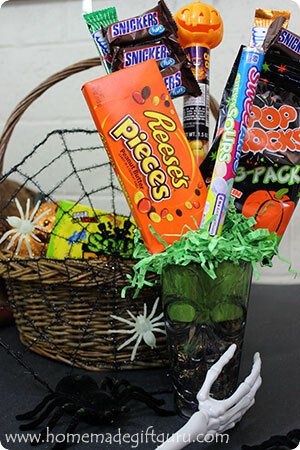 Attach to a jar, bag or bottle of Halloween-themed candy for a super simple Halloween gift. Jars can be as small as baby food jars or as large as a quart-sized canning jar. Larger jars can be layered for a nice look. ...Here's a few tips for how to save money by saving and re-purposing glass from your fridge and pantry. 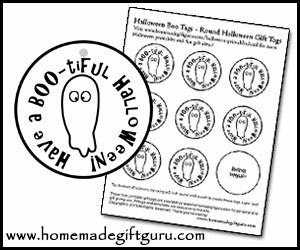 That's it for the 2 inch punch-able round Halloween gift tags but read on for a few other fun and creative printable Halloween gift tags. Here's several other cute Halloween printables that you can use to add spooky, happy batty-ness to your homemade Halloween gifts, Halloween treats and Halloween grab bags. Right click on the image and choose [print picture] or [save picture]... print as many as you need. To print several tags at once (or to resize tags), copy and paste tags into any word processor program such as Microsoft Word or Open Office (Open Office is a free program you can download if needed). For the "Trick or Treat?" gift tag: Fold top tab of tag down and adhere to back of tag to form a loop. Attach tag by running ribbon or craft cord under loop of gift tag and around gift. 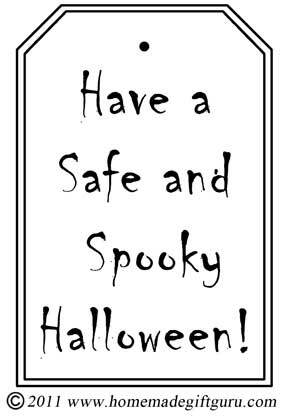 "Have a Safe and Spooky Halloween" is a great tag for kid's treat bags, classroom gifts or school gifts, and other Halloween gifts that may be for anyone going out Halloween night! "Happy Halloween" square gift tag... Fold top tab of tag down and adhere to back of tag to form a loop. Attach tag by running ribbon or craft cord under loop of gift tag and around gift. 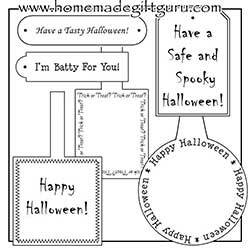 "Happy Halloween" round gift tag... Fold top tab of tag down and adhere to back of tag to form a loop. Attach tag by running ribbon or craft cord under loop of gift tag and around gift. I hope you enjoy these free Halloween printables!